Ignore us. Ignore the pressure from the media and Wall Street to make more money now as lockups expire and your stock price dips to new lows. The only thing you need to remember is “Facebook was not originally created to be a company. It was built to accomplish a social mission — to make the world more open and connected.” That’s your leader Mark Zuckerberg in his pre-IPO letter to the world. I say this because I worry you may be veering off course in a fit of desperation to please investors. This week you announced two new ad units that give businesses unprecedented access to the news feed. They pose grave threats to the user experience and your ability to accomplish your mission of bringing us all closer together. In the eight years since I joined your social network, I’ve only seen one moment more dangerous than this. After you opened the platform, quizzes and games from companies took advantage of the ability to publish to the news feed. The stream was soon overrun with app spam. So you did what was right. You protected the news feed by changing it so game posts only appeared to other gamers. This tough decision drastically reduced free growth for developers, hurting the partners who boosted your time-on-site. But by prioritizing the long-term health of the user experience so people kept coming back to Facebook, you ensured those developers would still have a business today. Now everyone wants you to generate more revenue, and you’ve found some ways that align with your mission. Pages can use Promoted Posts to reach more of the fans who’ve opted into their marketing updates. Mobile app developers can buy mobile-specific Sponsored Stories to show us what our friends are playing. 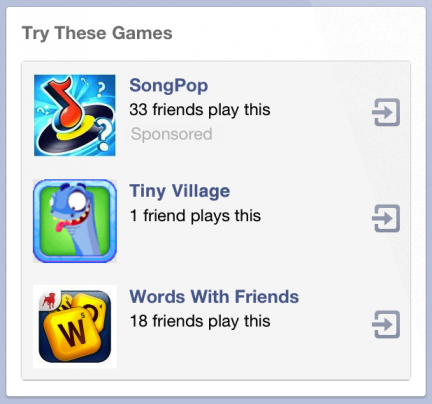 You’re starting to make ads more relevant outside of Facebook with your ad network appearing on Zynga.com. And you launched Facebook Exchange, a powerful cookie-based retargeting system that makes your sidebar ads helpful by reminding us of things we almost bought around the web. With time, these could blossom into strong revenue streams that satisfy investors. And there’s little danger since they embody your business model’s core ideology of connecting us to what we and our friends are interested in. But you’re also testing two new ad units that diverge from this pursuit. The new mobile app ads let developers target anyone with “Try These Games” ads in the mobile news feed that push people to download from their device’s App Store. Unlike the old app usage Sponsored Stories, none of our friends need to have installed the advertised app. Meanwhile, the new ads for Pages let businesses push their updates to the news feeds of non-fans. Again, these are not social. They inject marketing messages in the news feed from Pages we haven’t subscribed to and that our friends haven’t interacted with. For the first time you’re not relying on the wisdom of the social graph or the user’s choice to populate the stream. You’re trusting the user experience to the brands and the app developers. If they fail to accurately target me, I’ll end up with a less relevant feed. These are early tests, and I know you’re just iterating to see what sticks. You’ve been clear that limits may be put in place to keep these ads from overrunning the feed. Those kinds of limits are safeguard enough when we’re talking about paid social content that could have appeared in the feed anyway. But these asocial news feed ads contradict your mission, so displaying just few enough that users don’t get angry doesn’t cut it. Even if users occasionally click, the data won’t show that you’ve subtly but seriously altered the feel of Facebook. And its a slippery slope to a feed that’s less friendly and more like a scrolling billboard. You’ve built a company that’s meant to last. Even with a share price around $20 you’re trading at roughly 30x your next year’s earnings projection. That’s because those who believe in you believe you’re going to be the dominant social network for years to come. Asocial news feed ads jeopardize that. You’re extraordinarily popular and your network effect creates a giant moat. That doesn’t make you impervious to disruption, though. You’re arming your challengers by diluting the feed — the herald of ambient intimacy, a concept that let you redefine how we communicate. There are plenty of other ways to earn money, and with time they’ll pan out. But your foundation of relevant content has to stay strong for you to make it that far. One tenet of The Hacker Way is “Be Bold: Building great things means taking risks…even if that means being wrong some of the time.” This is one of those times, and it’s not too late to move away from asocial feed ads and get back on track. By focusing on our mission and building great services, we believe we will create the most value for our shareholders and partners over the long term.